In Little, director Tina Gordon presents a deeply contrived, narratively flawed and criminally mirthless high concept comedy about a female tech boss who is transformed into her younger self when the pressures of being an adult become too much to handle. 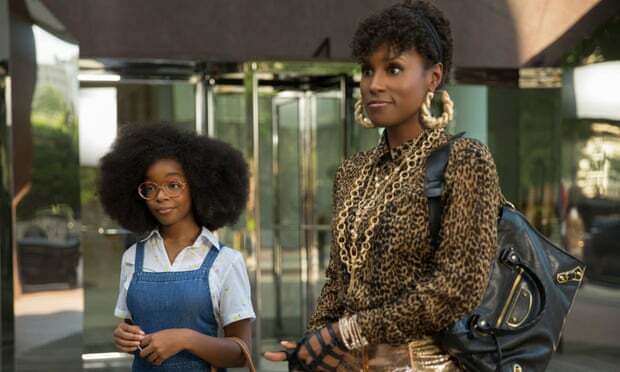 Starring Regina Hall, Issa Rae and Marsai Martin (the child actor from the TV show Black-ish), Little first made the headlines when it was revealed that Martin, who came up with the idea for the film after watching Penny Marshall’s Big, was to become the youngest ever executive producer for a studio film aged only 13. Jordan Sanders (Hall) is a ball-breaker. She is smart, tough and runs her tech company with such tyranny that she could make The Devil Wears Prada’s Miranda Priestly look like a pussycat in comparison. Taking most of her frustrations on long-suffering assistant April (Rae), Jordan’s perfectly curated lifestyle of designer clothes and easy hookups starts to fall apart when she wakes up looking like her pre-teen self (Martin) after an encounter with a young girl who does magic. Hilarity (not much of it to be completely honest) ensues when Jordan is ordered by child services to go back to school, while April takes her place at the company in the hope of winning a new contract with a major app firm. Disappointingly, Little falls at the first hurdle by failing to capitalise on such a great high concept idea. Opting for a rather pedestrian storyline and a series of skit-like set-ups we’ve seen countless times before, the film appears to be a mishmash of half-baked ideas which never quite come to fruition, and in the end we are left as baffled as its protagonists appear to be throughout. Gordon and co-writer Tracy Oliver (Girls Trip) miss opportunity after opportunity to step out of their comfort zone by offering a storyline by numbers. In a completely baffling sequence which sees young Jordan and April eating at a high end restaurant, the action is suddenly interrupted by an impromptu singing session which seems so oddly put together that it could literally belong to any other film. For all its messiness and tedium, one thing nobody can deny is that Marsai Martin is the real star of the show. She comes across as smart, funny and in the end you’ll find yourself wishing you were watching her in a different movie. Overall, Little brings almost nothing of value to the current trend of role reversal remakes. It is as shoddily executed and as disappointingly mundane as one might have expected. A mess of a movie saved by one single performance. Marsai Martin is the real deal.